Last month I received a letter, out of the blue, from a man in Warren, Ohio. 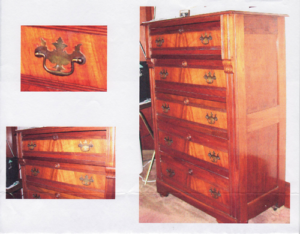 He started off by writing “I have no interest in selling this dresser, nor am I asking for an appraisal of it.” He wanted to know the age, what would be the appropriate type of drawer pulls for the age of the dresser, and the name of the manufacturer. Now, there’s not much I can tell from the 3 photos he sent. I cannot see the sides of the drawers, the back of the dresser, the construction techniques, any manufacturer’s markings. I cannot tell from his photos if the dresser is old or new. I don’t know the size. It appears to be wood, but maybe not. Maybe it’s particle board. And even if I could identify the manufacturer, the age, the type of drawer pulls, I would not respond to his request for information. If you’re at a dinner party and end up chatting with a doctor or attorney, would you ask for free advice? Well, ok, you might ask, but do you think the medical professional or lawyer is going to give you that free advice? Absolutely not. And appraisal professionals, whether they are asked to provide values (for valuation purposes) or non-monetary opinions (evaluations), are not going to give away their knowledge either. If you’d like to hire an appraiser, call first, get some details about how the appraiser works (not all appraisers will work from photographs), find out the fees involved, and schedule an appointment! 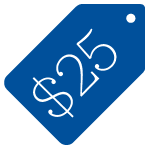 Most personal property appraisers can provide you with their fee schedule, their business hours, their areas of expertise and their credentials. But you have to ask first.